Probably for as long as there has been Scouting there have been Scout camps. There has also always been a medical presence, particularly during summer camp. Some camps have created staff patches for their medical/health and safety staffs. 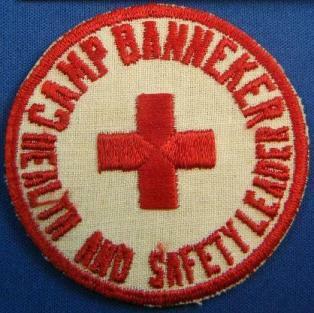 This is one of the earliest camp medical staff patches. Although it looks generic, I believe it was created for a Philadelphia area camp in the 1950s. 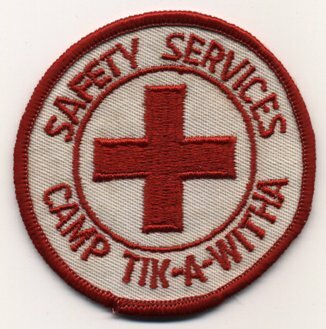 There are other patches in this series for other key staff members at summer camp (i.e. waterfront director). This is another early staff patch, also likely from the 1950s. 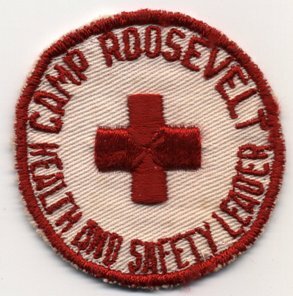 I am not sure which Camp Roosevelt to which this patch refers. Like the patch above, there are other patches in this series pertaining to other positions. 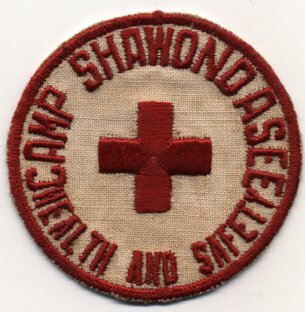 This is another staff patch from Camp Roosevelt. It is clearly a different loom run. It is differentiated by the thinner text and the fatter cross. I am not certain if this was used in a different year from the one above. Although this one has clearly been sewn and probably washed, I still believe it is different enough to be a separate issue. This is a similar patch to the Camp Roosevelt. I do not have this one, but, like the Camp Roosevelt, there are other camp positions with this camp. I would be interested in obtaining this patch. Given that there are three (see below) nearly identical camp patches, I believe there may be other camps with a similar patch, and I would be interested in obtaining them (or at least information about them). 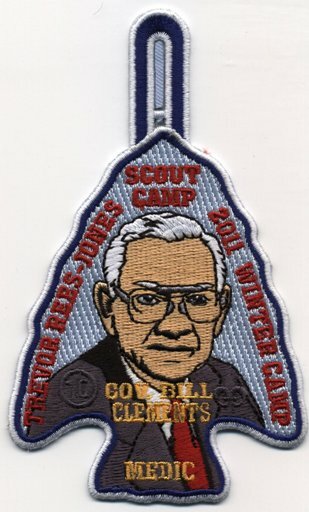 This is another camp patch with the similar theme. This one is for Camp Shawondasee. This is not a patch but rather a small (2 3/4") square with a plaque on it. 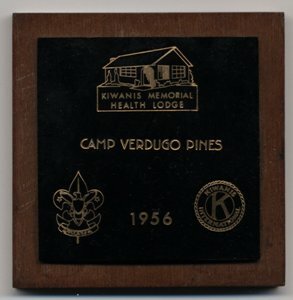 Perhaps this was made to commemorate the building and opening of the Kiwanis Memorial Health Lodge as mentioned on the plaque. Camp Raven Knob is in Old Hickory Council, North Carolina. This patch would appear to be from 2005 when they celebrated their fiftieth anniversary. This patch was designed for medical staff at Crater Lake Council, and it shows the health building on it. 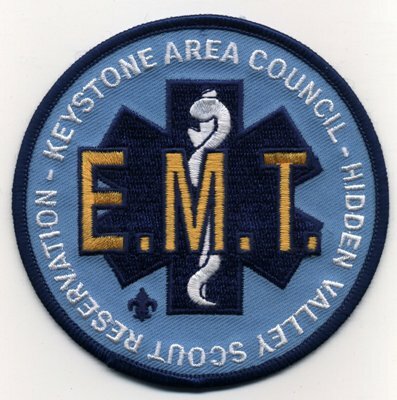 This is the EMT patch for Hidden Valley Scout Reservation. Presumably this patch was worn by the camp medic. I don't know what year it is from, but Keystone Area Council merged on April 1, 2010. The Circle Ten Council runs a winter camp each year at Camp Trevor Rees-Jones in Athens, Texas. It is staffed by the Order of the Arrow Lodge. They have issued many patches for the various staff positions. This is the 2010 issue for the medical staff (i.e. the camp medic). There may be earlier years, but this is the earliest that I have ever seen. 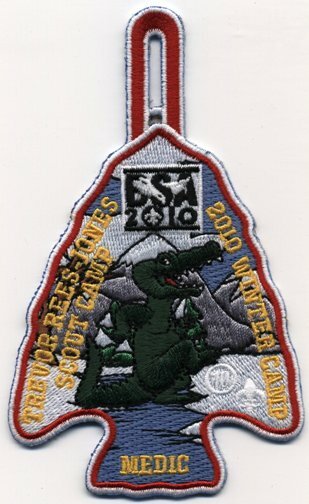 This is the 2011 medic patch for the Trevor Rees-Jones 2011 winter camp, described in more detail above with the 2010 patch. 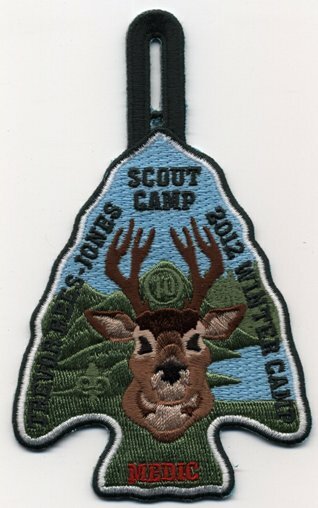 This is the 2012 medic patch for the Trevor Rees-Jones 2012 winter camp, described in more detail above with the 2010 patch. 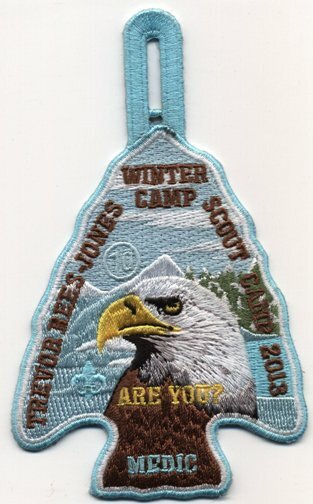 This is the 2013 medic patch for the Trevor Rees-Jones 2013 winter camp, described in more detail above with the 2010 patch. 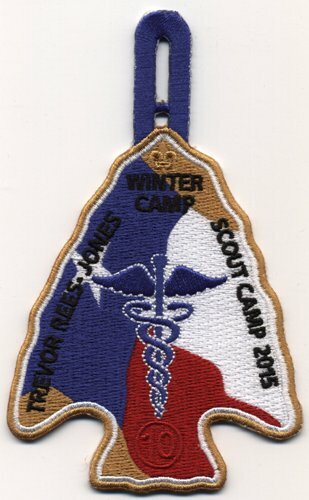 This is the 2015 medic patch for the Trevor Rees-Jones 2015 winter camp, described in more detail above with the 2010 patch. I was told that this council strip was issued at the Calumet camporee in 2012. It commemorates the health lodge at Elk Lick Scout Reserve. There are other patches in this series. This is the only Girl Scout patch in my collection. This is a medical staff patch from a Girl Scout camp in Mississippi.